It is right in the middle of summer in Thailand and Bangkok is supposingly hot like many other years I was here, but this year things are really turning strange. There was cool breeze blowing from China that for a week or two turned Bangkok into a resort on the mountain. And then the rain came and flooded the Southern part of Thailand. Whilst gearing up to help out the tsunami/earthquake victims in Japan, Thailand again had to look inside and face its own disaster. Several people believe that the end of the world is approaching - that finally the world is going to fall apart. Or are they confirming that what was shown in the movie "2012" is just going to happen for real? Some were stunned by the fact that "nothing lasts, everything will pass". Others quickly embraced the principle "live today to the fullest, worry about things only when they arise". Lets' just say I am like the latter, for today and the next few days. Because it is the Thai New Year - The Songkran Water Festival. It is the greatest time of the year when everything is so nice - the city is calm and peaceful, no traffic jam, people are more generous, and we all get to play water, in any form of splashing, shooting, or throwing a big bucket of water. For once, we are not hesitant to get wet.... and be happy! And I do need a break from practicing fondant. Set aside fondant, flower gumpaste, and edible glue... I just want to be with T, getting wet and happily celebrating our festive time together. That cake is stunning! I love that water theme. So pretty and decorated with much finesse. OMG everything looks so amazing! Happy Songkran celebrations, Kris! 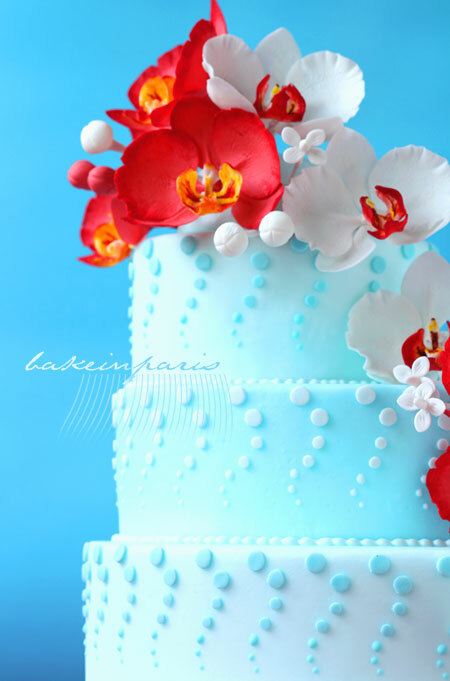 Your water-like cake looks absolutely divine. 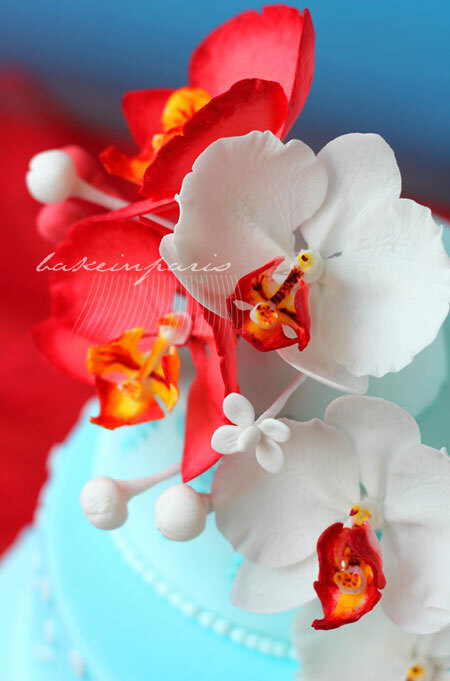 And did you make those fondant orchids yourself? Wow! That is one beautiful cake. You're doing a wonderful job with the fondant. I'm only just learning myself and it's a great experience. Now tell me that these flowers are real...! How exciting, enjoy this time! you have a nice philosophy. 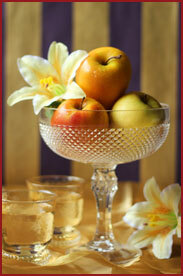 I love your choice of backround color here, so vibrant and shows off this delicious treat nicely. Please don't say this 'practice' anymore, this is so stunning. The way you put dot, so nice.. I loves the flower too, they looks real. Well happy Newyear then! I am thinking those are actually sugar flowers are they not? They are absolutely stunning and so is the cake! So beautiful! This is beautiful!!! Kris. The color, the tone, the look and the setup. I love it. What an amazing cake. It must have taken you hours and hours of work. You are an amazing artist. I wish this was facebook so I could *like* this. Or wait, I wish I could *love* this. Perfection again, eh, Kris? It's is a little daunting what is going on here in Japan, but we are on the way to recovery. The water festival sounds like a wonderful time. Your cake is a great homage to it! Believe me, you're an artist! Happy new year Kris! Maybe the year ahead bring you lots of joy and happiness! This cake is absolutely stunning. I'm speechless. I wish I can make cakes as beautiful as this! Kris, are the flowers made from fondant??? I am STUNNED!! your creations are ever increasingly beautiful!!! You are a poet of cakes. Your every creation looks like a stunning poem for me. 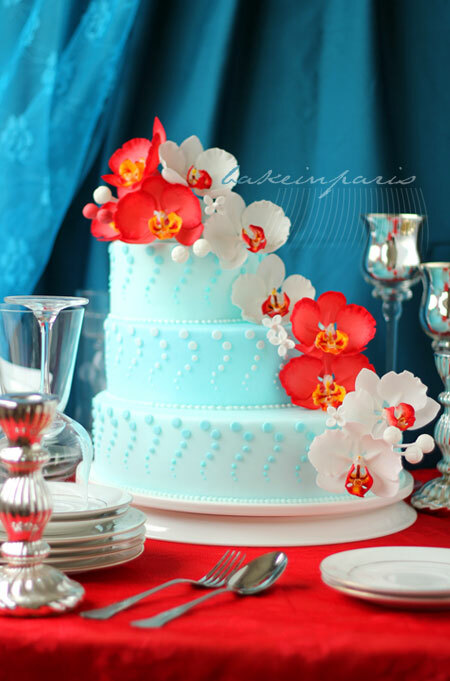 Wow Kris this looks stunning and this is my fav color combo.. the sugar flowers are stunning .. very beautifully done. A truly gorgeous creation! The orchids look so real too and the colours are absolutely sweet! I met you at Kinokuniya, Paragon last week and exchanged blog addresses with you :)I am amazed by your cakes and your photography!! I hope I can do flowers like you soon! 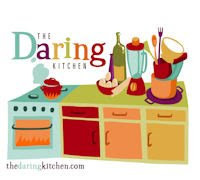 Will be following your blog! Hope you will manage to come to Malaysia as planned. 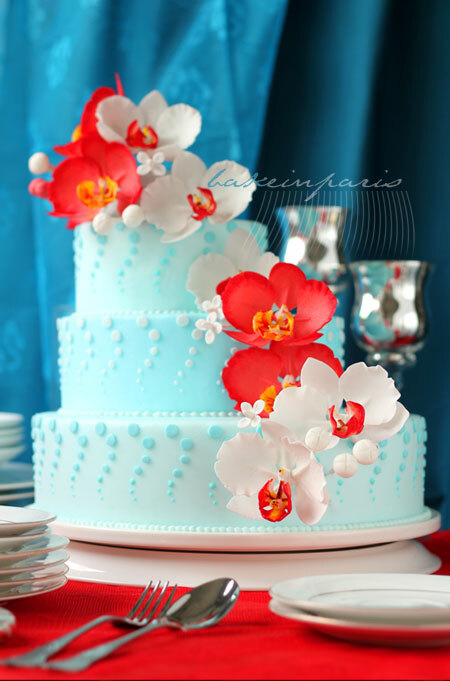 Your cake is fabulous, it is a testimonial to your natural skill how far you have progressed in such a short time, although I guess your first fondant forays were also fabulous. End of Days....I don't think so. But I'll take any excuse to spend more time with those I love. 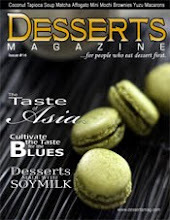 Thanks for the lovely post, both in visuals and writing. I agree that you should focus on the present happiness that is available to you though perhaps also being aware of the long-term effects of our actions. Hope you had fun splashing around with T! This cake is another piece of art :). Hi Kris, you are quite right in many points! Here too is incredibly strange! We have been experiencing weather phenomenons lately and we are actually waiting for the big earthquake to happen anytime soon in California. You see, anywhere we are is not safe at all and there is no place to take refuge. My take on this is one like yours but focus more on love towards one another rather than thinking only of oneself. There is too much hate going around these days. Very nice post you have and incredible cake that is a first in the world, I have to say! Bravo Kris!!! so pretty! Kris, this is perhaps your most exticing post so far. I love the design! 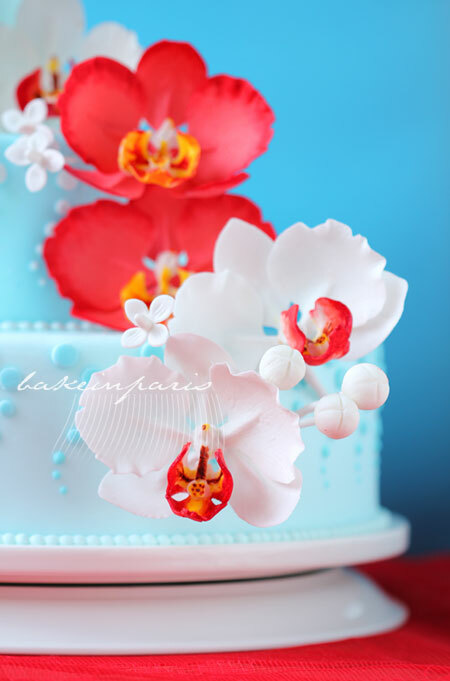 Hello, I new here, Was just passing by and saw your orchids, what a beutiful cake and philosophy. You really are coming in to your own with your fondant work. I'm not the biggest fan of fondant cakes 'cause they can sometimes look a bit cartoonish, but your fondant work is flawless & stunning.